RICHARD: "So don't move here for Derek. Move for you." RICHARD: "With your practice based here, and the money I'll put into promoting you, you'll be one of the biggest names outside Manhattan." RICHARD: "I'm ready to put my money where my mouth is." NICOLE: "I'm like the oldest living prospective college freshman not to go to first base." ALEX: "Don't worry. There are way bigger losers than you, trust me." [narrating] "At the end of the day, there are some things you just can't help but talk about. Some things we just don't want to hear, and some things we say because we can't be silent any longer. Some things are more than what you say. They're what you do. Some things you say because you have no other choice. Some things you keep to yourself. And not too often, but every now and then, some things simply speak for themselves." PRESTON: "I don't want preferential treatment." RICHARD: "And you're not gonna get it. You're not married, you're not hiding. You came to me. You clearly value your relationship. What you two have together, I understand that, Preston, and it does matter." MIRANDA: [steps in front of Derek] "No. Turn around and walk away." DEREK: "No, I wasnâ€™t going-"
MIRANDA: "Yes you were. Come on. You canâ€™t do this. You donâ€™t have the right. Not anymore." DEREK: "I just want to find out if she's okay." MIRANDA: "She's not. She's a human traffic accident, and everybody's slowing down to look at the wreckage. She's doing the best she can with what she has left, and I know you can't see this, 'cause you're in it, but you can't help her now! You'll only make it worse. So walk away. Go!" NICOLE: "I don't like you." NICOLE: [pauses, smiles] "Now that's just politically incorrect." "I get one night off in two weeks and I waste it on you? You couldn't even have bothered to kiss me goodnight. You're a coward, and you're just as shallow as you seem. So no to your favor. No to you. No!" PRESTON: "So where do we stand?" 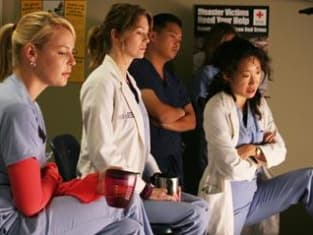 CRISTINA: "At the northeast corner of the hospital?" GEORGE: "We have to do something. Meredith has become like an exhibit. Like a zoo animal. Like that rare panda that everyone stares at." IZZIE: "Please don't say that to her face. I think that panda died alone." GEORGE: "I'm just saying we should do something to cheer her up." "You three -- how about you brush up on how not to embarrass me in front of the Attendings, or I'll see to it that your hearts stop beating. We clear?" DEREK: "I'm not moving back to Manhattan. I'm not the same person I was in Manhattan." ADDISON: "I know, I know. You're a flannel-wearing, wood-chopping fisherman. I get it!" [narrating] "Communication. It's the first thing we really learn in life. The funny thing is, once we grow up, learn our words and really start talking, the harder it becomes to know what to say. Or how to ask for what we really need."